I lead on learning disabilities for the National Development Team for Inclusion (NDTi). It's important to note that all organisations providing NHS or public funded adult social care must have fully implemented the Accessible information Standard by the end of July. Local screening programmes should firstly make sure they adhere to all local policies and processes that ensure compliance with the standard. In addition, they can share best practice with other screening providers and make use of any national resources, support and advice. The Making reasonable adjustments to cancer screening report is one of a series of reports published by the learning disabilities public health observatory looking at reasonable adjustments for people with learning disabilities. It brings together information, ideas and good practice for providing reasonable adjustments in cancer screening in one publication. It includes a summary of policy and guidance along with links to websites that contain accessible information in a range of formats. 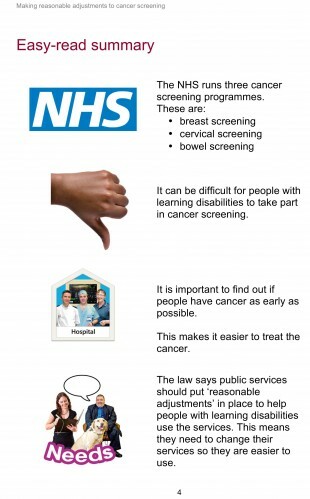 In addition, there are examples of reasonable adjustments put into practice which can give providers ideas about how to improve access to cancer screening locally. Another very useful resource is the Improving the uptake of screening services by people with learning disabilities across the South West Peninsula: A Strategy and Toolkit. This report covers the five NHS young person and adult screening programmes – breast, cervical, bowel cancer, abdominal aortic aneurysm and diabetic eye. It is based on a scope of practice in the Peninsula region – Cornwall, Devon, Plymouth and Torbay areas – along with a less detailed look at practice elsewhere in the South West and relevant national evidence including a literature search. The authors used this information to develop an evidence-based toolkit and strategy for improving access to screening services by people with learning disabilities across the South West. The report also includes recommendations that could be used to inform the national debate on identifying people with learning disabilities in national cancer screening programmes so that reasonable adjustments can be provided at the screening invitation stage. These two reports relate specifically to young person and adult screening programmes but many of the principles and approaches within them apply equally to antenatal and newborn programmes.